Vampires, demons, and a tall, blond bishounen? Can you really go wrong? 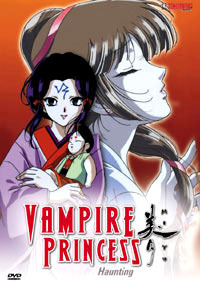 Vampire Princess Miyu TV started first with a manga series that has been released in English, by Studio IronCat, and then graduated to an OAV series that was released in English by AnimEigo, and then became a TV series, which is now being handled by TOKYOPOP. All parts of the series, manga, OAV or TV, all focus on the 'Vampire Princess' Miyu, a girl who has been chosen because of her lineage to spend the rest of her days in an immortal life, chasing down the 'Shinma' and returning them to the darkness. The Shinma are beings that manipulate humans to use their bodies, energy, or love. They have no real regard for human life, and most unfortunate humans who are possessed by Shinma are destroyed by them. Miyu is accompanied by her Shinma protector, Larva, a Western Shinma who fell victim to Miyu's vampiric embrace and is now at her side, bound by blood and love, for as long as she lives. In the anime series, the story starts out with Miyu spending her days at a high school in Japan, Tokiwa High School. She can often hear rumors of strange paranormal activities and happenings from the classmates. Although she doesn't admit it, she enjoys her time pretending she's a normal human girl. In the class, she makes three human friends, Chisato, Yukari and Hisae. These girls show up frequently in the show, every other episode or so, and are unaware of Miyu's true calling and nightly pastime. Episode 4 : Reiha Has Come This was the introductory episode for one of the main antagonists in the series, Reiha, a snow demon with unknown ties to Miyu from the past. The two meet up unexpectedly on the hunt after one Shinma that resides in the countryside of Japan, and their different opinions and tactics clash as the Shinma make themselves known, and decide that they don't want to return to the darkness just yet. This episode shows off Reiha's powers and her influence over Miyu, yet we still don't know their connection. Episode 5 : Sepia Colored Portrait An aged professor stumbles upon an old film of his, the one piece he did that he never completed, his first and final production. He realizes that his whole life has been lived out hopelessly, as he clutched onto a dream for so long that he lost track of reality and what went along with it. A Shinma has taken advantage of his sadness and desire, and Miyu is left to destroy the Shinma before it claims more lives and dreams. Episode 6 : Ghost of Miyu A Miyu look alike has sprung up in Tokyo, and is causing a lot of confusion amongst Miyu's classmates. This look-alike is acting mysterious and a rash of vampiric incidents have come about since the look-alike arrived. Miyu is worried for her reputation as the Guardian, and also about the intent of the creature. The weird coincidence turns out to be intentional as the being makes itself known as a Shinma and battles against Miyu, but which Miyu is which? Episode 7 : Fate A homeless brother and sister with telepathic and telekinetic powers befriend Miyu. A short while later, the brother meets a mysterious dog, who basically tells him he must kill Miyu to protect himself and his sister. Does Miyu intend to hurt the boy and girl? Are one of them Shinma? This volume had episodes that dealt with desire, the Shinma desiring to live peacefully with her animals in episode three, the professor's desire to fulfill his dream in episode four, the Shinma's desire to replace Miyu and discredit her in episode five, and the brother and sister's desire to stick together in episode seven. In the end, desire brought tragedy to all involved, and it makes one wonder if desire is a mortal sin after all. The Japanese voice cast of Vampire Princess Miyu TV was a well-known and respected one. Larva, who was quite silent in the OVA's is rather vocal in the TV series and is voiced by the throaty Shin'ichiro Miki (Kudou Yohji - Weiß Kreuz). Miyu the soft-spoken, wise Guardian is voiced by Nagasawa Miki, (Ibuki Maya - Evangelion). Last but not least, the eerie, snow demon child Reiha and her aggressive doll Matsukaze is voiced by the multi talented Ogata Megumi who voices both male/female characters exceptionally well. She is also the voice of Ikari Shinji from Evangelion, Sailor Uranus from Sailor Moon and Yukito from Card Captor Sakura. The English voice cast of Vampire Princess Miyu TV was made up of relative unknowns. Well, I certainly hadn't heard of them before and on the internet there was no information I could bring up of past or recent works that these voice actors have done. The voice actress for Miyu has an excellent attitude in the voice of the young Guardian, but more often than not, is too monotonous and makes Miyu sound like an automated machine. Larva's voice actor has the deep, watchful tone that the original seiyuu had, but he loses points in the character department. He doesn't go out and grab you by your ear, making you latch onto his every syllable. Out of the three inhuman characters, Reiha's voice is the one I felt didn't fit at all; she was way too childish and giggly for Reiha. She didn't sound like a snow demon, but rather more like a giggly schoolgirl. Also, her doll's character, Matsukaze seems more sarcastic, bossy and like a childish brat rather than the hotheaded aggressor that he was in the Japanese version. But overall, the voice acting in the English dub wasn't that bad. Most of the extras, oddly enough, had voices that fit them to a T, but Reiha and Matsukaze's voices completely change the feel of their characters. Compared to the first Vampire Princess Miyu DVD that TOKYOPOP released, I was a lot more impressed by the way this one was set up. The opening option screen was very attractive to the eye and ear, and the menu was a lot easier to read then the last. This DVD also had two previews for other TOKYOPOP works, which I always see as an interesting bonus. Another high quality image gallery was available to peruse, except for the fact that I couldn't find out how to operate it using my Cyberlink DVD player. On the first DVD, it was harder to navigate from episode to episode, and they didn't divide it up into sections. This one has an Introduction, Opening, Part A, Part B, Closing and Preview for every episode. It gives you the full episodic experience. I think TOKYOPOP is going places with this series. Just the planning of the DVD structures, with 4 and 5 episodes per DVD being the norm, would please many fans - more episode for their money. If possible, a few more extras would be nice... perhaps production notes, dub bloopers or background music clips, for example?